Monarch Precious Metals hit a homerun with its first Viking-themed bar, and now an all-new design is available in the popular series with the release of the Flail and Shield design. 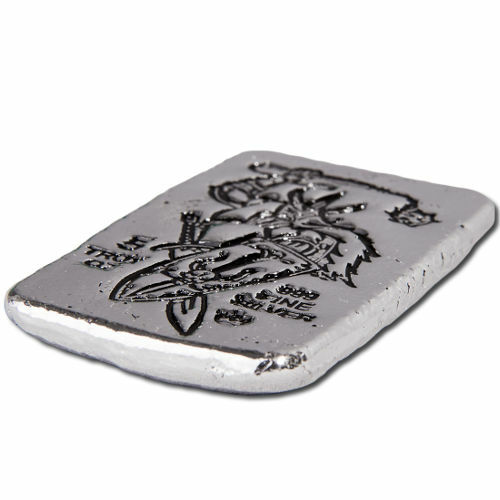 Monarch Precious Metals silver bars now feature flat, stackable design forms and increasingly intricate designs that give the mint a one-of-a-kind catalog amongst competitors. 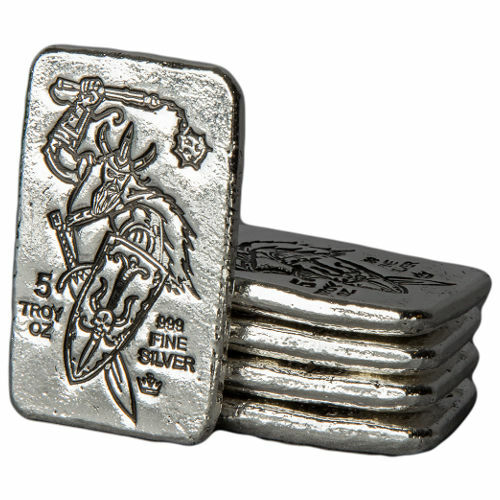 The 5 oz Silver Monarch Flail and Shield Viking Bar is now available from Silver.com. Second design in the Viking Bar series! Ships to you in a protective plastic sleeve courtesy of Monarch Precious Metals. Obverse features the Flail and Shield design. Reverse is flat with no engravings. Produced using hand-poured, hand-stamped techniques. Struck in America at a private mint. 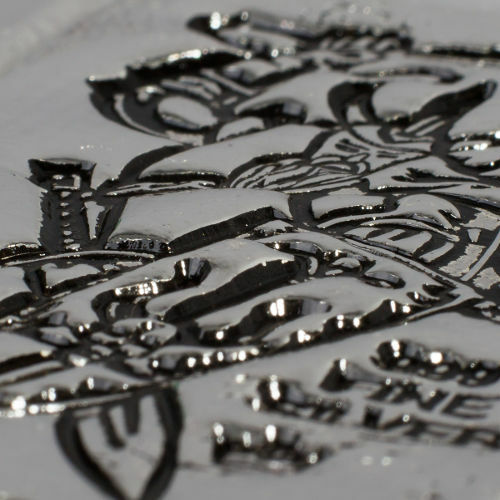 The Viking Silver Bar series from Monarch Precious Metals debuted in early 2016 with a striking design of a Viking warrior brandishing a shield and sword. Now, the second release in the series is ready and features a similarly imposing image of an armor-clad Viking warrior. 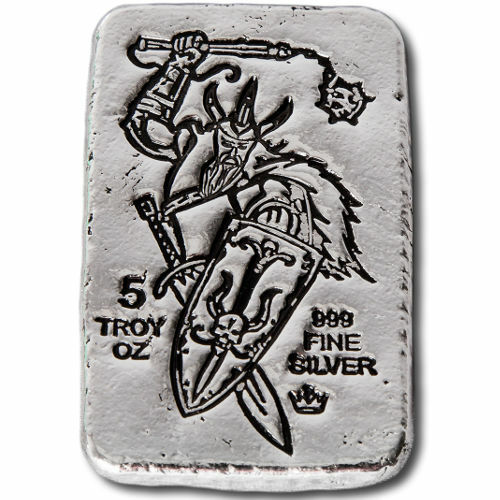 In the 5 oz Silver Monarch Flail and Shield Viking Bar you’ll notice the warrior brandishing a frightening weapon known as a flail. The flail evolved in the Late Middle Ages in Europe as a peasant’s tool for use in the fields. It eventually found a home on the battlefield with both a long- and short-handed version. The flail featured a steel ball at the end of a chain, length of robe, or bit of other fabric that allowed its user to swing it around. The steel ball was often spiked, and rather than being designed to kill with precise blows, it was a blunt object meant to inflict maximum damage, though unfortunately not always immediately lethal damage. 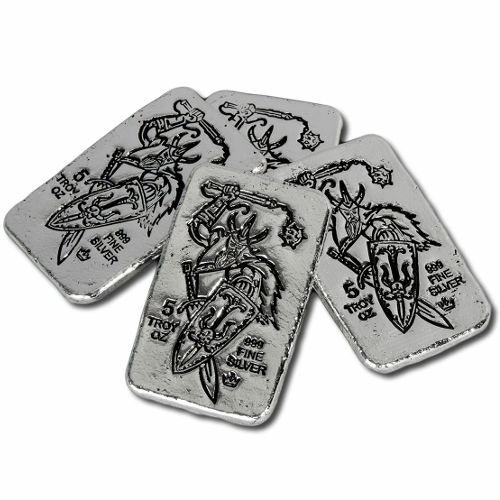 On the obverse face of the 5 oz Silver Monarch Flail and Shield Viking Bar you’ll find a warrior swinging his flail overhead in preparation to strike out at an enemy combatant, while protecting himself with his own shield. The reverse side of the bar has no engravings. All Monarch Precious Metal products, both silver and gold, are hand-poured with a minimum fineness of .999. These bars feature a stackable design that is flat, making storage easier. Monarch Precious Metals operates out of its facility in the Rogue Valley of Oregon, which opened in 2008. Please direct your questions to a Silver.com associate at 888-989-7223, chat with us live online, or email us.